Your wheels are wobbling and your engine is pinging. The windshield is all smashed or the cooling system is leaking antifreeze faster than you can add it. It’s the last straw. Get an Instant Online Offer for Your Car! Enter your zip code below to get your FREE estimate and see how much your car is worth. Get paid the real cash value of your car in 24-48 hours! You’re sending this pile of junk to the nearest car junkyard. For thousands of Americans every day, that’s the decision they make. Their car won’t pass Go, and won’t collect $200. It’s destined to be stripped down, crushed, melted, and made into a clothes dryer or new car. Because at the end of its life, a car that’s no longer roadworthy heads straight to the scrap or junkyard. Hopefully you’re not too sentimental of a soul. What happens at a junkyard seems really harsh, especially if you’ve really enjoyed owning your car. At car salvage yards, vehicles are unceremoniously disassembled for their good parts, squished into tiny cubes, and sent off to a smelter. The remains are melted down into liquid metal where they’re formed into raw steel or aluminum and sold to manufacturers. There are auto salvage yards in every state across the nation, coast to coast. If you want to find a junkyard near you, it’s not too difficult. The challenge, as always, is getting the most money from your junk car as you can. The basic auto scrap yard simply takes in cars and crushes them, then sells them to a smelter. There’s no middle step of stripping off car parts or sorting materials – it’s quick and easy and doesn’t require a massive yard. 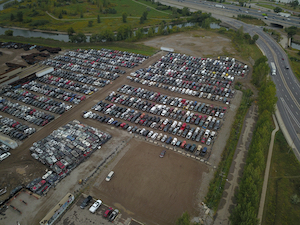 You’ll find auto scrap yards in dense areas because there isn’t as large of a space requirement for them. Finding a scrap yard starts with an online junkyard search. Google ‘scrap yard near me’ and you’ll see dozens of results. 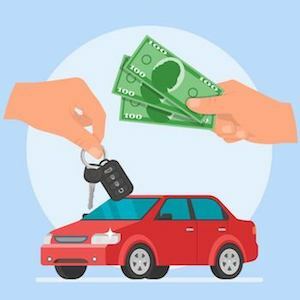 The bonus is that you’ll probably be able to choose the top result and sell your car there instead of hauling it far away. Wrecking yards have a different approach. Before cars are crushed and sent to be melted into raw steel, any good used car parts are stripped off. Many wrecking yards will clean up, test, and sell these used car parts to local garages or directly to car owners as replacement parts that are much cheaper than buying new. But like the common scrap yard, the car’s remains will eventually get the big squeeze in a car crusher, loaded on a truck, and shipped off to a smelter. When you perform your online junkyard search, wrecking yards require a quick sift through the results. The benefit of finding a wrecking yard over a basic scrap yard is that car wreckers might see more value in your vehicle than just raw steel. If your car runs and drives, for example, they can make more money from your car when they sell the parts, so you might be offered more for it. Finding a self-service junkyard is very much the same as finding any other auto junk yards near me. The difference between the two is very different though. Self-service junkyards are junk yards that buy cars near me and you, place them in a yard accessible to the public, and allow people to take off the parts that they need. It’s a fantastic option for people who want to save money on parts when they fix their car by themselves. There’s no real expectation that you’ll be able to get more money for selling your car to a self-service junkyard. But it’s really good to know of self-service junkyards if you’re looking to fix up your car to keep it running, or to get it ready to sell on the cheap. If you’ve done the search for car junk yards near me and have been unimpressed by the offers you’ve been given for your car, don’t worry. There’s a better option available. DamagedCars buy vehicles in any condition from people all over in the US. Wondering why it’s better to choose DamagedCars than to search for junk near me? It’s because you don’t have to pay for your car to be towed to the junkyard, you’ll get paid a fair price, and we do all the heavy lifting for you. Just request a quote for your car just like it is now. It can be an accident vehicle, a total loss, a flooded car, rusted, dented, not running, or not driving. It doesn’t matter what it’s like – we’ll buy it. If the quoted price works for you, we’ll send you payment fast, often within just a day or two. We’ll pick up your car and take care of the title transfer fees, all while you rest easy in your La-Z-Boy recliner. So see how much your car is worth now! to finish up and get your offer. Page not loading?Click here to redirect.